A note from Christina: Those of you that read this blog have heard me talk about my good friend and prop stylist, Amy Paliwoda. Amy is also the owner of The Surface Library, (this is not a sponsored post) where you can rent all kinds of beautiful props and backgrounds for your shoots. 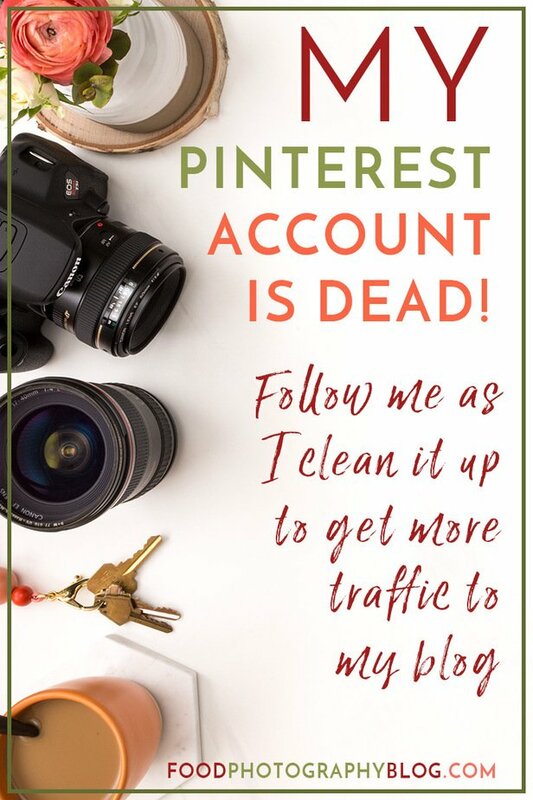 Amy’s post is in response to a poll I did on the blog asking what kind of info you would like me to write about. The top two answers were about photo backgrounds and props. 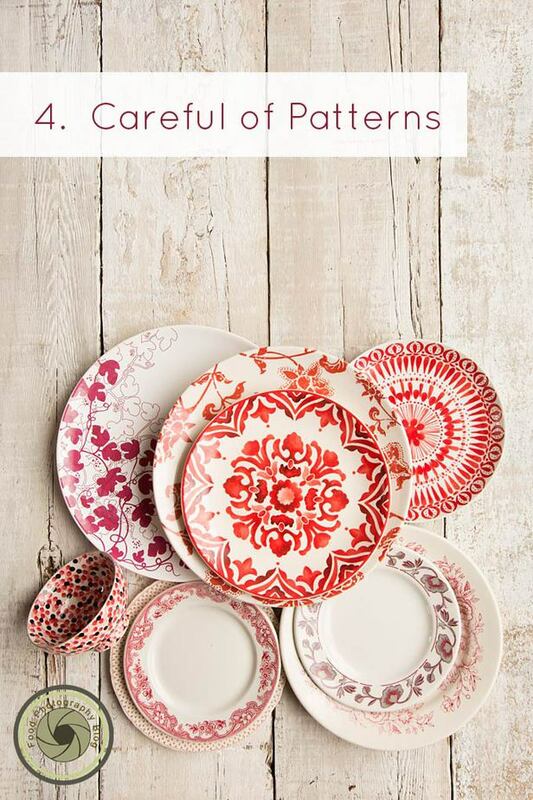 I figured, what better person to write posts on picking the perfect plate, but Amy Paliwoda! So Amy, take it away! Recently, Christina asked me to do a guest post about props. 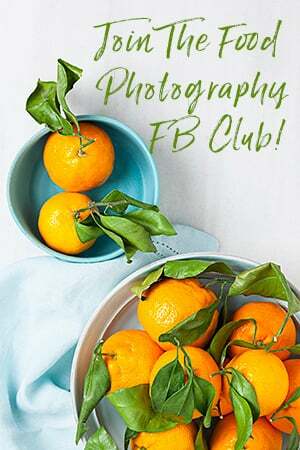 We teach an awesome, and fun food photography class together several times a year. One of the things that people ask the most about, and seem to struggle the most with, is choosing the right plate for their shot. In taste and styling, all things are subjective. 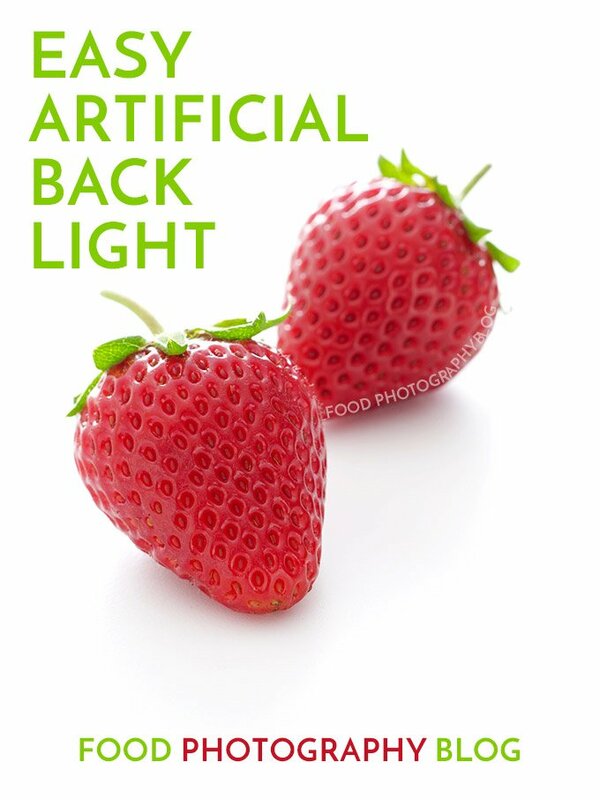 It seems so simple and intuitive, but I’ve realized there are some definite guidelines to adhere to that will help achieve a more polished look for your food photography. 1. Size. Bigger isn’t better. This is the simplest, most important tip regarding plating. Professional prop stylists will almost never use a dinner plate. Nine times out of ten (unless it’s a rib eye steak, or you’re shooting for a commercial restaurant and adhering to their plates and serving size), we choose salad plates. The reasoning behind this is twofold. Number one, a smaller plate both simplifies a mass of complicated ingredients, such as pasta, and allows you to get a tighter frame of your food. Secondly, because it is small, you can put less on the plate without too much negative space around the food, allowing it to look abundant. You’re new mantra? You are not the Cheesecake Factory. Less plate is more shot. Let your salad plate be a dinner plate, and let your dinner plate be a platter. It’s all about what looks good to the camera. 2. Plate Lip. What’s your angle? If you are shooting a hamburger, you know you need to be at a low angle, because who wants to look at a bun? If you’re shooting a bowl of soup, you’ll need to raise the camera enough to see what’s in there. Simple stuff, I know, yet it comes up in class all the time. If you are shooting at a low angle, and you are using a plate with a deeper bowl/higher lip, you are losing too much of what’s important about your shot. The first thing you need to know about your set is, “What is my shooting angle?” If you have a tripod, I BEG you to use it. 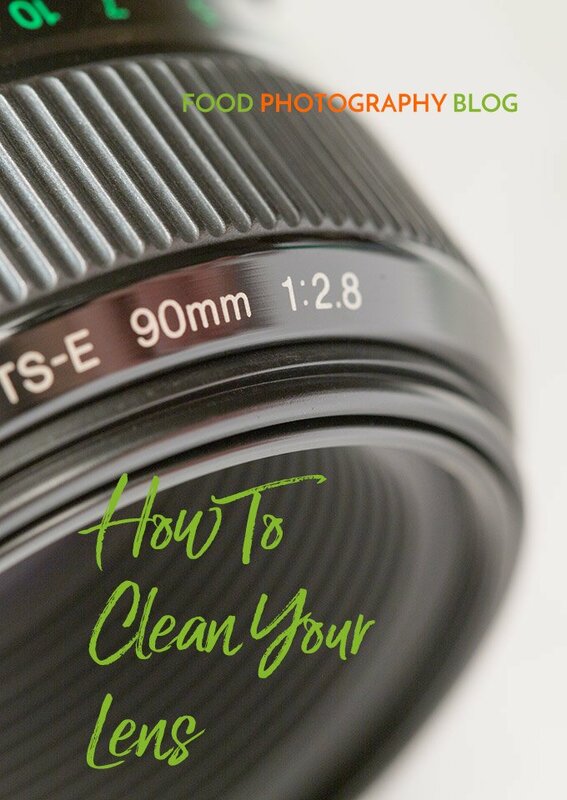 I swear, it will change your photography forever for the better. 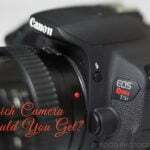 If you don’t, decide how you want to see your shot before you put food on set, and than get a tripod. 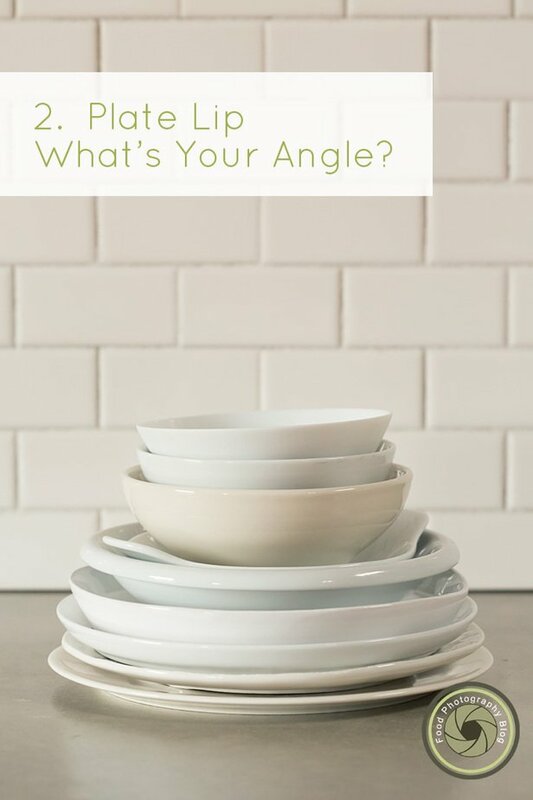 Use flat plates or low rims for lower angles, rimmed dishes or low bowls for higher angles. 3. Colorful Plates. 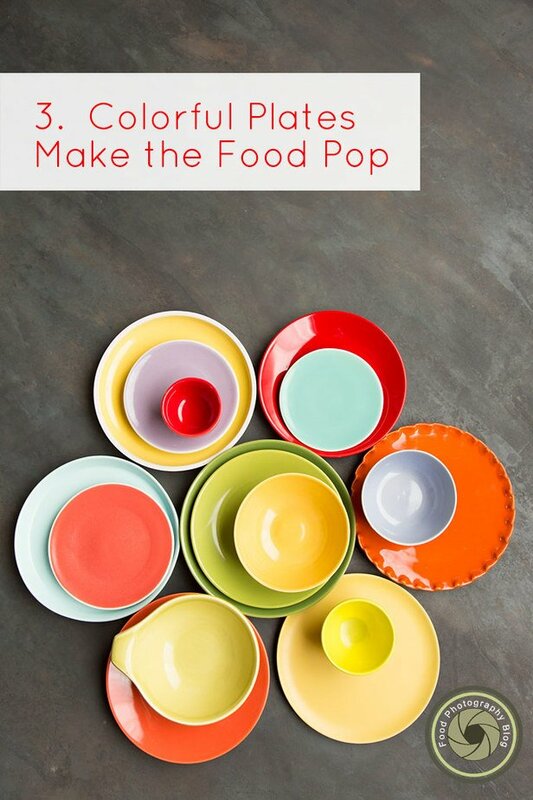 Make the food pop. So you have a purple salad plate that you’re dying to use because you’re tired of shooting everything on white. Cool! Or…NOT cool. It all depends on what you’re shooting. If the color works with the food, and helps the food pop visually, you’re good to go. Otherwise, move on. I have props I’ve brought to twenty shoots, and never used, because they weren’t quite right. The goal is always to pull focus to the element of the shot that you want people to look at first. 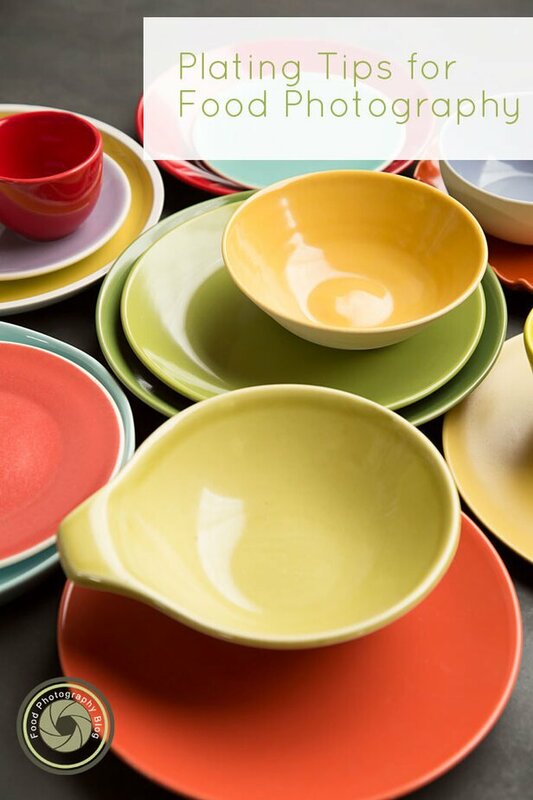 You don’t get into the tabletop prop rental business without a love for beautiful dishes, and we have tons of great patterns. My advice for patterned dish ware is, a. See above. Does it distract? There’s a not so fine line between a slice of cake on a beautifully patterned plate, and a mass of food on a patterned plate that looks like a rejected shot from the 1960’s Jello cookbook (I know you’ve seen it…). Yes, you love your Grandma’s dish ware, but it’s not for every shot. Enough said. 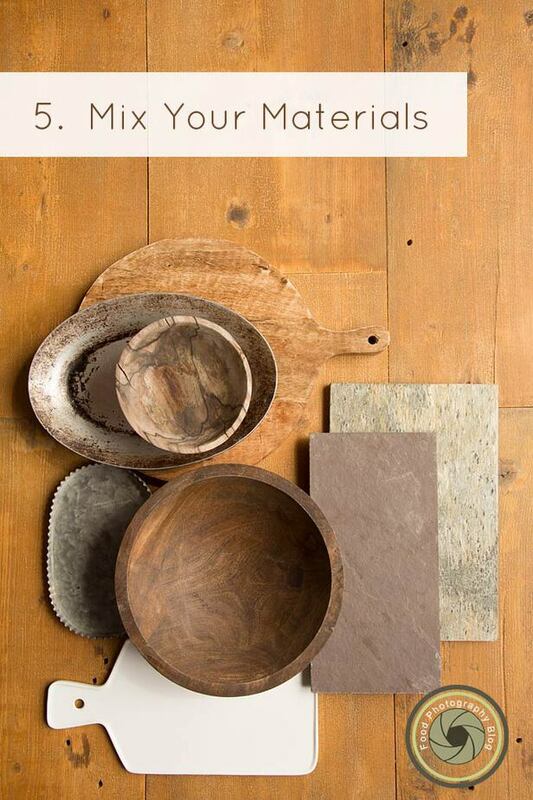 If you want to keep things interesting, don’t forget metal, wood boards, parchment paper, and/or layering all of the above. The list goes on. Any surface will work, as long as it isn’t so distressed that it looks like a recipe for listeria (Pet peeve. There is a point where dishes and flatware transition into ‘gross’ territory). So there it is. 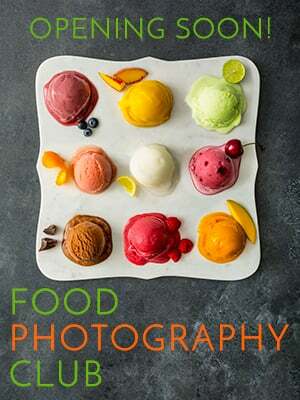 Simple, effective, common sense tools for food photography plating. Happy shooting! Thank you, Christina, for your wonderful blog. And thank you, Amy, for the great tips! 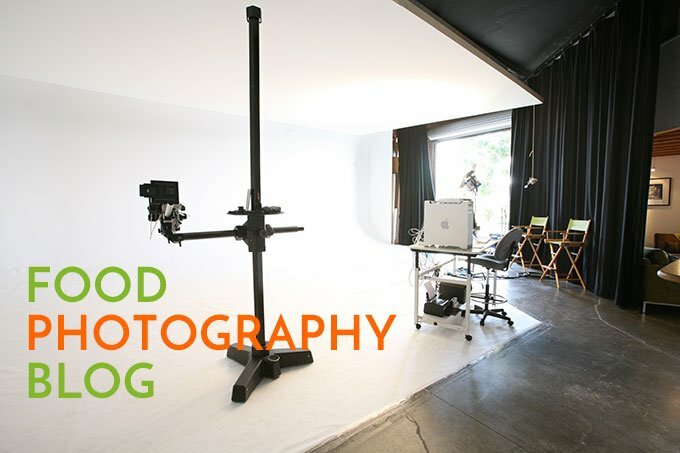 I’m always on the lookout for ways to improve my food shots and our blog! Thanks Rob! Glad you’re enjoying the blog. Happy Shooting! Thank you for the tips on plates. Simple and easy advice. Thank you for always providing such great information. 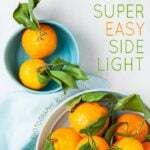 Even as a professional food stylist, it’s always great to be reminded of the basics. Cheers! Thank you for all of these tips! I’m starting my own blog and currently in search of a dinnerware set that I can use for hosting/serving, but will also be usable for a lot of my food photography. I am SO in love with the set pictured in the second image of this post (bigger isn’t better). Any idea where that set is from? Hi Nicolita, It might be from pottery barn, but let me check with Amy as it might be older stock not made anymore. I’ll get back to you. 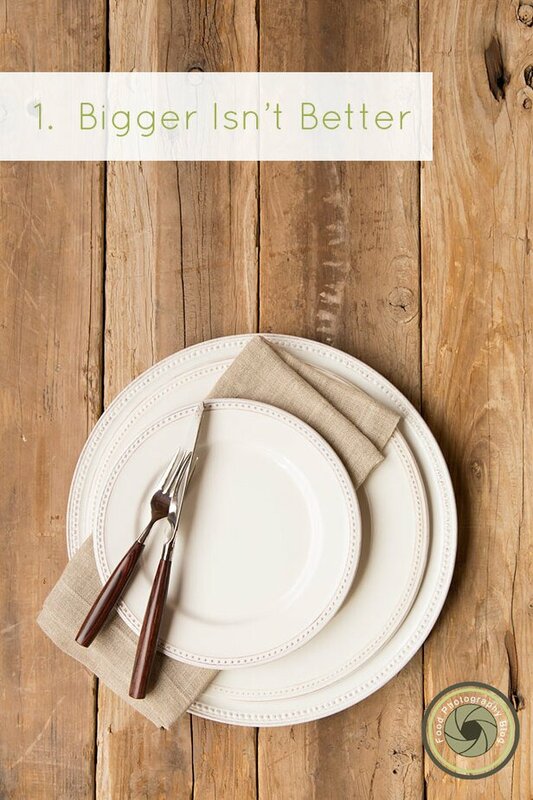 That plate setting is from Sur La Table and it’s called “Pearl Collection”. It’s still avail as of today, July 30th. Awesome! Thanks so much for looking into that for me! I love your humour in your articles. 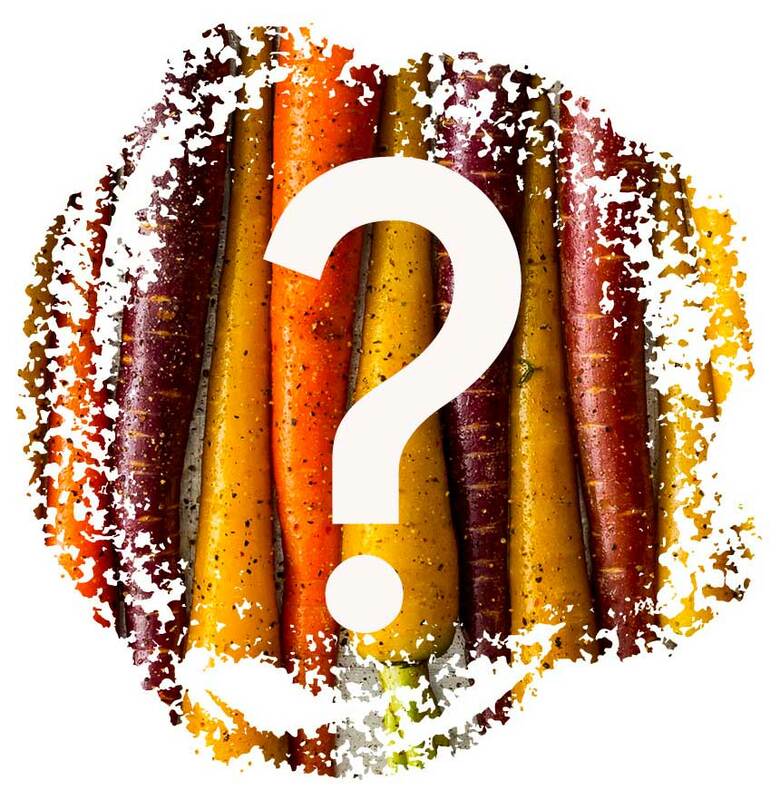 I’m no food blogger (yet) but your articles are insightful to read and will definitely help me take better pictures of food…which, i’ve found that has a LOT more going on behind the scenes than almost everybody anticipates. It’s so crazy. 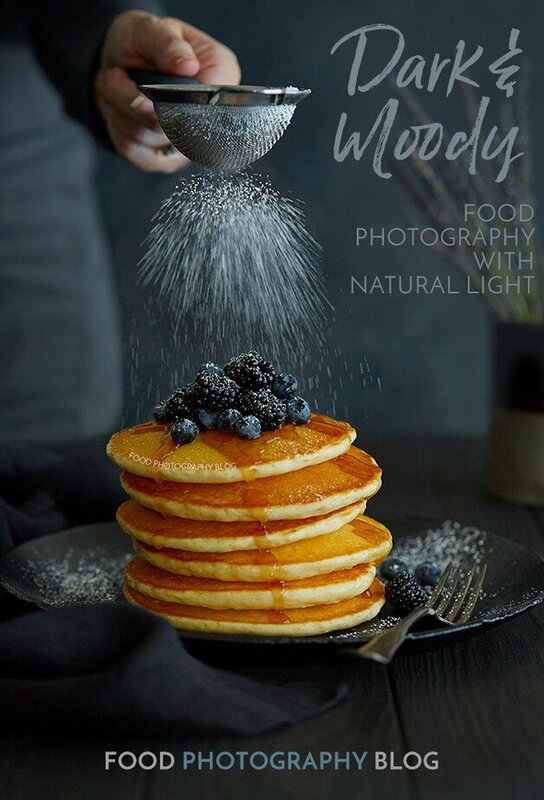 Great tips – I have just started a kids cookery blog but haven’t yet figured out how to take a well-lit photo, nor what type of plate looks best! Hi Iris! Thanks for reading and glad you like the blog! Thank you so much for this! I definitely needed it! I do have one question: can you recommend me any brands of plates or a store in can shop at to find plates that shoot well? Sorry if this seems like a dumb question, but I am having trouble finding decent plates. Thank you! Hi Rita! This is not a dumb question at all and it can be a problem finding decent props depending on where you live. I have a blog post all about it. 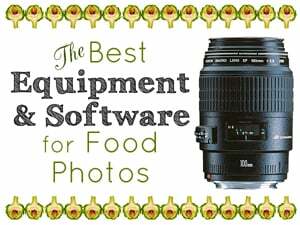 Thank you for the tips, I am a professional chef and always loved food photography, I am now starting my food blog and these are precious tips. Hi Andreia, thanks for reading the blog! Thanks for your post, it is very informative. 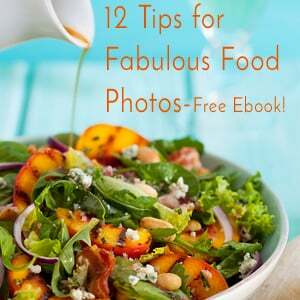 Do you have suggestion about using round plates versus square plates for pictures? 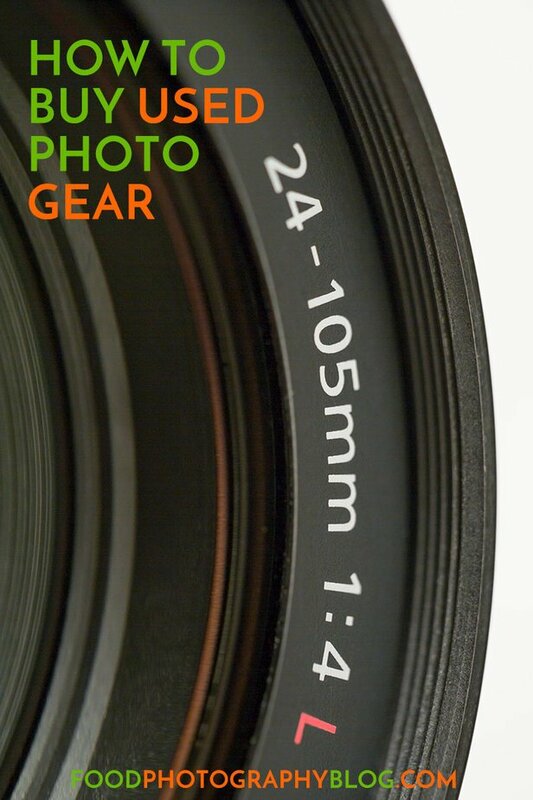 I mostly see round plates in the blog pictures, is it preferable. Hi Shehryar, square plates are great too! Round is most common but absolutely doesn’t mean you have to use round plates all the time. I love seeing plates of different shapes. It’s a nice change.